October is Sudden Cardiac Arrest (SCA) Awareness Month. With more than 350,000 out-of-hospital cardiac arrests occurring annually in the United States alone, we want you to be prepared to respond if ever called upon. Let’s start with the basics. Sudden cardiac arrest is due to a problem with the electrical system of the heart, causing the heart to stop beating normally. If this happens, the heart stops pumping blood to the brain and other vital organs. SCA is not the same as a heart attack. A heart attack is a problem with blood flow to the heart, causing the heart muscle to die. An easy way to distinguish the difference is to view a heart attack as a plumbing issue, whereas SCA is an electrical issue. When the heart is not receiving enough oxygen or is injured, it may go into an abnormal heart rhythm and no longer pumps blood effectively. The most common arrhythmia resulting in sudden cardiac arrest is ventricular fibrillation (V-fib), in which the heart becomes overwhelmed with chaotic electrical activity. Heart attack is the leading cause of SCA. 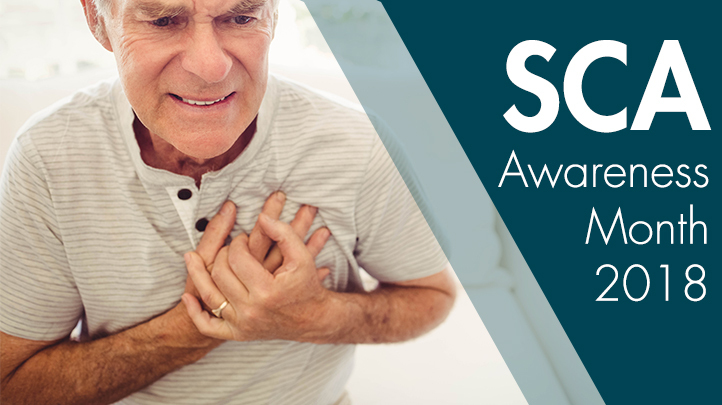 A heart attack is caused by a blockage or spasm of a coronary artery. SCA must be treated within minutes. CPR can supply oxygen to the brain and other vital organs to keep them alive, but it usually cannot restore a heartbeat in an adult. CPR basically buys time until an automated external defibrillator (AED) can be used. An AED detects the abnormal heart rhythm and sends an electrical current through the heart. It reboots the heart by briefly stopping the chaotic electrical activity and allowing the heart to resume its normal rhythm. The sooner an AED shock is given, the better the chance of survival. It is most effective when used within 3 minutes after cardiac arrest has begun. If the victim is unresponsive, always yell for help and send someone to call 911 and get the AED. It’s critical that EMS responders arrive as soon as possible. This can’t happen if 911 dispatchers have not been notified. Immediately begin chest compressions and use the AED as soon as it arrives. The use of AEDs is becoming more common across the country. Locations that provide access to AEDs include airports, stadiums, shopping centers, gyms, schools and office buildings. 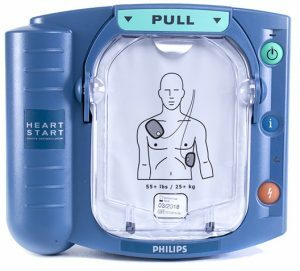 AEDs are made to be simple and user-friendly, even if the rescuer has never been trained. This may be done by pushing a button, lifting the lid or pulling the handle. The AED will guide you through how to apply the pads and when to stop compressions in order to run its assessment. The AED will prompt you to deliver a shock if one is needed. Quickly look up and down to ensure no one is touching the victim and loudly say ‘Clear’ before pressing the shock button. The AED will analyze the heart rhythm every 2 minutes. The AED will not shock a person whose heart is not in a shockable rhythm, even if the shock button is pushed. It’s normal to feel nervous, even when using an AED trainer that doesn’t have the capability to shock. Make it a priority to take a class to practice CPR and using an AED, so you feel confident responding in a real emergency. Knowledge is power. Spread the word and share this blog with your friends, family and co-workers.